U.S. #980 was issued on Harris’ 100th birthday. 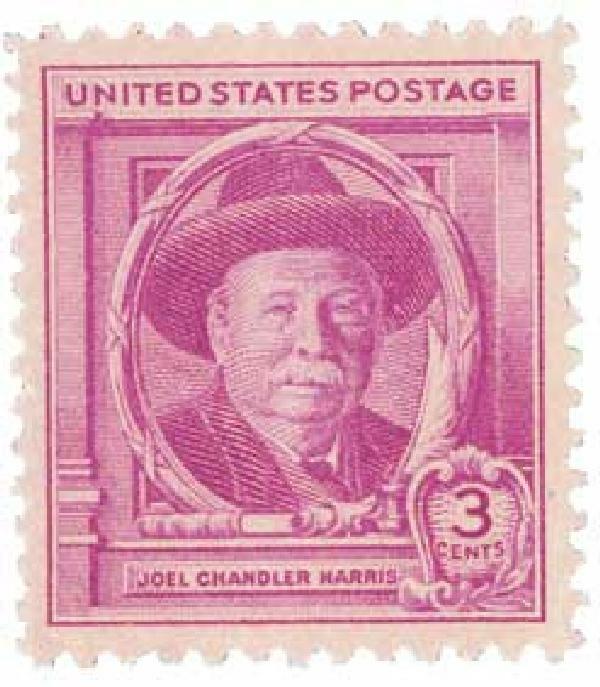 Author Joel Chandler Harris was born on December 9, 1848, in Eatonton, Georgia. In school Harris did well in reading and writing, but was more known among his classmates for his jokes and pranks. Harris ended up leaving school at an early age to work. He was hired as a “printer’s devil,” a young boy whose position was apprentice or lower, for The Countryman newspaper. With a circulation of about 2,000, the paper was one of the largest to serve the Confederacy during the Civil War. 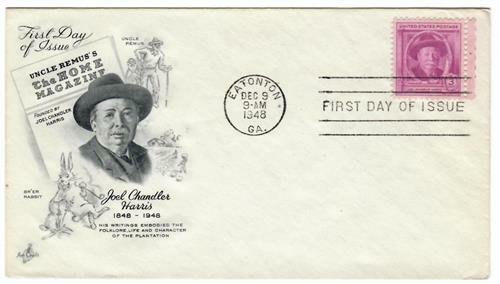 U.S. #980 – Classic First Day Cover. The editor, Joseph Addison Turner, allowed Harris to publish his own work in the paper and include humor in his journalism. Turner also let Harris live at his Turnwold Plantation, where the youngster spent hundreds of hours in the slave quarters during his time off, developing a close connection with the slaves and learning their stories and language. 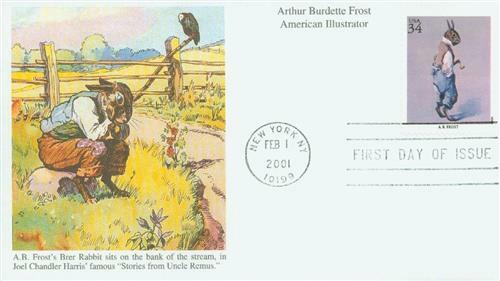 Harris later incorporated their African-American animal tales in his famous Uncle Remus tales. U.S. #3502g – A.B. Frost’s illustration of the Brer Rabbit. After The Countryman shut down in 1866, Harris worked for other papers, but found a home with the Monroe Advertiser. His humorous writing was popular and reprinted in other papers around the state. This success led to an even better job offer – associate editor of the Savannah Morning News, where he quickly became the state’s most popular humor columnist. Then in 1876 Harris took a job with the Atlanta Constitution, where he would remain for 24 years. During that time he also wrote for Scribner’s, Harper’s and The Century. The same year he began working for the Constitution, Harris began writing his Uncle Remus stories “preserve in permanent shape those curious mementoes of a period that will no doubt be sadly misrepresented by historians of the future.” The stories were serialized in newspapers across the country. 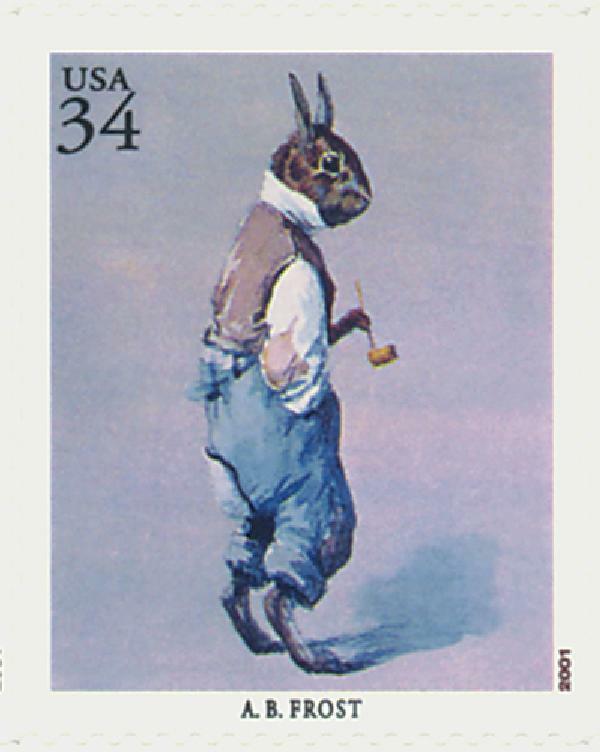 U.S. #3502g – Brer Rabbit First Day Cover. Harris’ Uncle Remus stories were so popular, he was approached to have them compiled and published into a book, which he did in 1880. Uncle Remus: His Songs and His Sayings received hundreds of positive reviews and was a best seller. 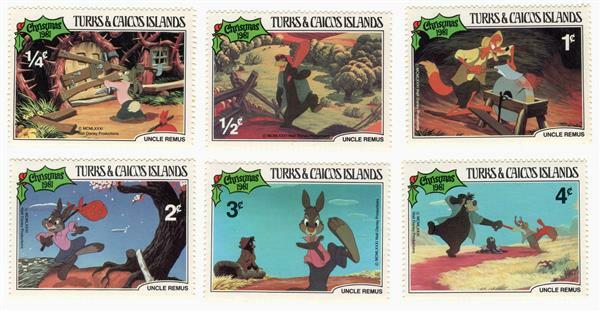 Turks & Caicos #496-501 – Disney stamps picturing scenes from the Uncle Remus tales. Harris died on July 3, 1908, in Atlanta, Georgia. Click here to read some of Harris’ work. 2 Responses to "This Day in History… December 9, 1848"
Dave, it wasn’t Harris’ work. He simply wrote down the stories that African slaves brought with them to America. Brer Rabbit, a trickster, originated in African folklore and was transmitted by African slaves to the New World. Tar-Baby was inspired by Harris’ reading of William Owens’ work on black folklore. If this happened today, Harris would be in court fighting countless copyright infringements.